Luton boss Mick Harford was overjoyed to see midfielder Luke Berry mark the year anniversary of his horrific double leg break at Colchester United in the perfect fashion, with a goal in Town's 2-1 win on Saturday. Rewind 12 months and Berry was being taken to hospital after suffering a sickening injury just six minutes into clash at the JobServe Community Stadium, Luton going on to lose 2-1. The 26-year-old finally returned properly in December, after spending almost nine months on the sidelines. However, 365 days on and he was finding the bottom corner of the net when Elliot Lee’s deflection into his path, making it 2-0 to the visitors, doubling up James Collins’ opening strike. Harford said: “It’s actually a year to the day he damaged his ankle at Colchester, so it’s a good anniversary for him to get a goal after that nasty injury. “We’re absolutely thrilled for Luke. Striker Collins was another thrilled to see Berry netting his third goal of the campaign, saying: "They’re sometimes the ones that go in for you. "It’s another great move in and around their penalty box and Bez was brought here as a goalscoring midfielder. "He got one last week when I was away, and he’s got another one, maybe not the cleanest of strikes, but he’s doubled our lead and he deserves it. "Everything he’s been through, I couldn’t be happier for him. He’s a great lad, he works his socks off, so I’m really delighted for Bez." 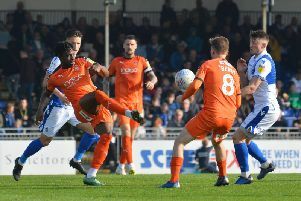 Meanwhile, defender James Justin was another who couldn't have been happier to see the popular Berry on the scoresheet once more, his 11th since joining the Hatters from Cambridge in August 2017. "Hopefully we'll be in the Championship and it was just a minor setback in his career. "I’m sure he’ll have an excellent career in front of him and he just marked the anniversary in style."